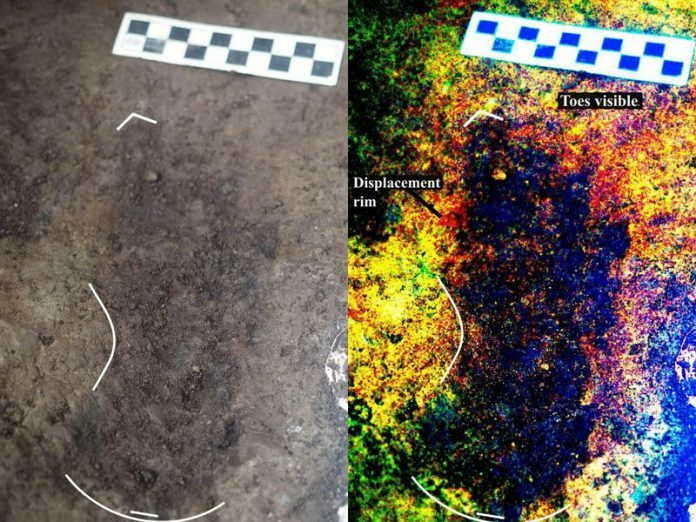 Researchers in Canada have discovered dozens of ancient footprints that might be the earliest known evidence of human migration in North America. The prints, uncovered on the Pacific Coast, offer a glimpse into the lives of our ancestors who lived on the continent some 13,000 years ago, and they might help reveal how ancient humans traveled in the aftermath of the most recent ice age. It goes without saying, but 13,000-year-old footprints are obviously pretty hard to come by. The prints were found buried deep under the present shoreline, and were originally left in soft soil that was buried and subsequently hardened. A total of three distinct sizes of the foot impressions have been found, suggesting that they tell the tale of a group of two adults and one child as they made their way along the coast. The prints are extremely valuable to science, especially given their assumed age. Prior to this discovery, the oldest human footprints found in North America are thought to only be around 5,000 years old. Others in South America are much older, but the migration of humans through what is now the United States and Canada is still largely a mystery. The research, which was published in the journal PLOS One, explains how these tracks may support one particular theory of human migration into the continent. The hypothesis is that in the waning years of the last ice age, humans are thought to have traveled south along the Pacific Coast after entering North America via a land bridge from what is now Siberia. Using the shoreline as their guide, early humans may have relied on the ocean for resources as they traveled south through present day Canada and the United States. Proving this was the case is obviously incredibly difficult. Finding bones and other artifacts only goes so far, and footprints are almost always gone long before scientists would have any hope of finding them. These newly-discovered tracks paint a very interesting picture of our ancestors, and seem to fit very well with the coastal migration idea, but it’s far from a smoking gun. Going forward, more discoveries like this will be needed if archaeologists have any hope of nailing down their theories.